Sl. No. PUBLIC RELATION Cons. Circular Dated 17.12.2014 From PR Branch on the Subject : Dispatch & Publication of 'A Guide for Employees' and 'A Guide for Employers'. Office Order No. 04 of 2014 of Hqrs. Office from PR Branch . वर्ष 2014 का कार्यालय आदेश संख्या 04, दिनांक 15.12.2014 को जनसम्पर्क प्रभाग द्वारा जारी . Circular Dated 02.12.2014 From PR Branch on the Subject : Innovation Action Plan 2014-15. दिनांक 02.12.2014 को जन सम्पर्क द्वारा जारी आदेश का विषय : नवप्रवर्तन कार्य योजना 2014-15. 34/14-PR Circular Dated 11.11.2014 From PR Branch on the Subject : Organizing of Workshop/Awareness Programme on 'Sexual Harassment of Women at Workplace ( Prevention , Prohibition and Redressal )' in ESI Corporation. 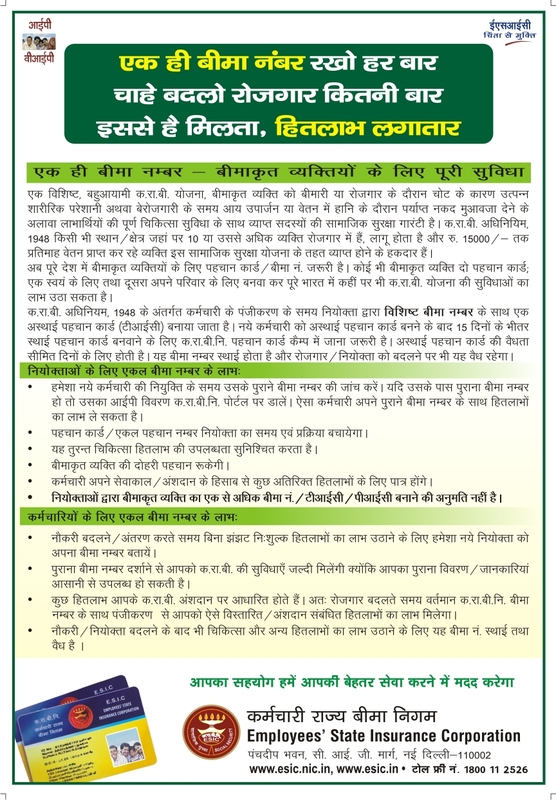 29/14-PR Circular Dated 27.09.2014 From PR branch on the subject :Display of Banner/Poster/Standy on the "Swachh Bharat"/ National IntensiveCleanliness Drive. 28/14-PR Circular Dated 13.08.2014 From PR branch on the subject :Displaying of Poster on Mission, Vision of ESIC reg. 24/14-PR Circular Dated 30.07.2014 From PR branch on the subject : Dispatch of Leaflet/Flier on 'ESI Amnesty Scheme, 2014'- reg. 05/13-PR Circular dated 09.05.2013 From PR branch on the subject : Displaying of Poster on Holding of Suvidha Samagam reg. 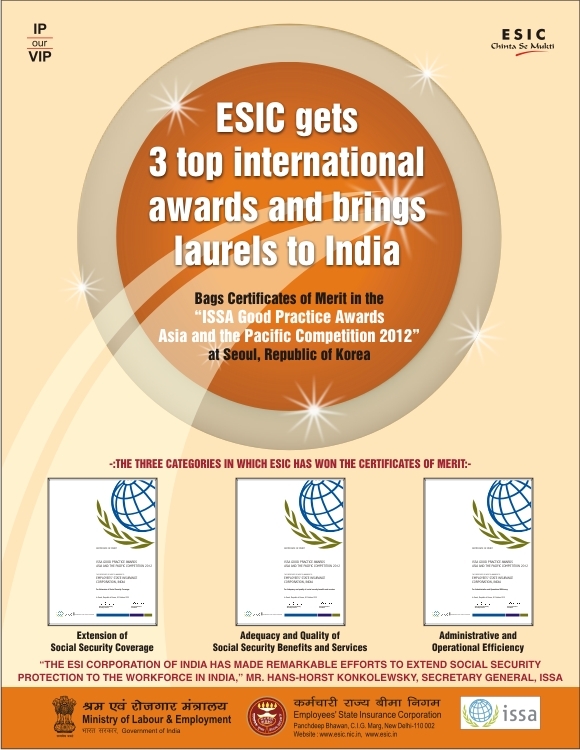 34/12-PR Circular Dated 09.11.12 from PR Branch on the subject : ESIC bagged 03 Certificates of Merit in the "ISSA Good Practice Awards, Asia and the Pacific Competition, 2012". 32/12-PR Circular dated 12.10.12 from PR branch on the subject : Creation of Multiple Nos. of TICs / IP Nos. regarding. 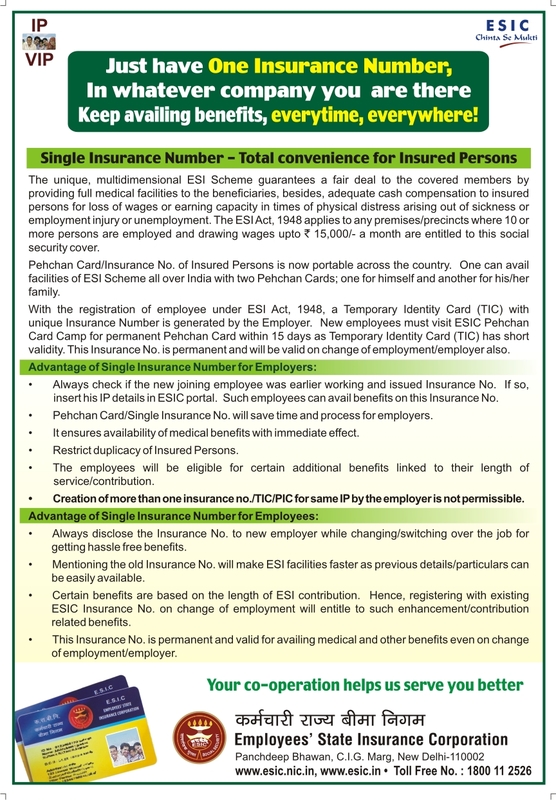 Pamphlet on use of Single Insurance Number (English). 31/12-PR Circular dated 27.09.12 from PR branch on the subject : Uniformity in use of ESIC logo. 23/12-PR Circular dated 03.08.2012 from PR Branch regarding for using/displaying new Logo/Signboard/Direction Board / Panel. 21/12-PR Letter dated 20.07.2012 Public Relation Branch on the Subject : Handbook-ESIC Medical Services Hospitals(Non-Receipt).